I am not a fan of the 1992 Disney film "Newsies," a musical based on the 1899 New York City newsboy strike against publishing magnate Joseph Pulitzer. Songwriters Alan Menken and Jack Feldman managed a few good songs, but they couldn't fight their way past director-choreographer Kenny Ortega's incompetent storytelling, amateurish direction, and laughable music-video choreography. I thought the film would vanish without a trace. But the property has returned in a stage version at Paper Mill Playhouse, completely rethought by new scripter Harvey Fierstein and with additional songs. Much to my surprise, it's entirely winning. While there's a bit more work to be done, I smell a hit. 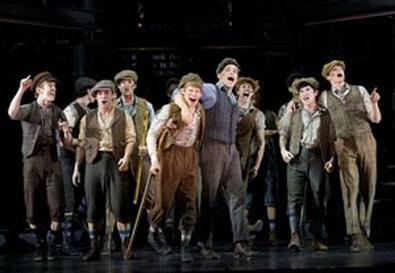 Like the film, the show follows the story of 17-year-old newsboy Jack Kelly. An orphan, Jack hates the grinding hardship of his life and longs, in one of the show's best songs, to go to "Santa Fe" and start a new life. When Jack meets brothers Davey and Les Jacobs, forced out of school and into the newsboy racket because their father has been fired after being injured on the job, he sees 10-year-old Les as a ticket to greater earnings and offers to show them the ropes. But when Pulitzer decides to gin up his profits by charging the newsies 10 cents more per paper, the charismatic Jack says no and leads his confreres in a strike, with Davey providing the brains and Jack the spark. Pulitzer retaliates with thuggish violence, and the fight is on. Fierstein deserves major props for his intelligent restructuring. Unnecessary characters have been mostly pared away, and the story now accretes with satisfying force. Adding a love interest for Jack in the form of Katherine Plumber, an intrepid young female reporter intent on busting into the all-boys club of journalism, works very well and removes the unintentional (though often amusing) homoeroticism in Jack and Davey's onscreen relationship. Though Fierstein retains the film's fablelike approach, his characters are more grounded and believable. Menken and Feldman have added some top-notch tunes, particularly Katherine's "Watch What Happens" and "Don't Come a-Knocking," a combination performance number and character song for Medda Larkin, a vaudeville performer with her own theater, and Jack and Katherine, watching in a box. What Fierstein has yet to solve, though, is that Medda still feels too tangential to the story, plus the florid characterization of Pulitzer as a melodramatic villain. The character needs rethinking—and a better number. Jeff Calhoun's stylish and confident direction moves with the fluidity and speed the show demands, and he has cast it well. The ebullient Jeremy Jordan is giving a breakout star performance as Jack. You know it when you see it, and I saw it. Kara Lindsay is a delightful Katherine, spunky and smart, a fine singing actor. Ben Fankhauser's Davey grows into maturity with specificity, while the potent Vincent Agnello never once crosses the cute line as Les. Andrew Keenan-Bolger is affecting and dry as Crutchie, a newsie with a bad leg. The other 14 actors who constitute the paperboys aren't given a great deal with which to differentiate themselves but coalesce into a vibrant group with a personality all its own, which is probably the point in a show about the importance of unions. That excellent actor John Dossett, as Pulitzer, sings powerfully but is hamstrung by the writing. Christopher Gattelli's ambitious choreography, executed thrillingly by these talented youngsters, could be a bit more character-specific, but it mostly succeeds, shot through with adolescent testosterone and boyish enthusiasm, particularly his strike dance. Tobin Ost's inspired Erector Set set works beautifully with Sven Ortel's projections and Jeff Croiter's lighting to evoke the harsh and constraining urban environment, and Jess Goldstein's costumes appropriately suggest poverty through a fairy-tale lens. Danny Troob's stirring orchestrations sound better than they should with only 12 players. Paper Mill Playhouse deserves great credit for turning this troubled property into something that could have a long life. Keep working, guys. There's not all that much left to do. Presented by Paper Mill Playhouse, by special arrangement with Disney Theatrical Productions, at Paper Mill Playhouse, Brookside Drive, Millburn, N.J. Sept. 25–Oct. 16. Wed.–Sun., 7:30 p.m.; Wed., Sat., and Sun., 1:30 p.m. (973) 376-4343 or www.papermill.org. Casting by Telsey + Company.